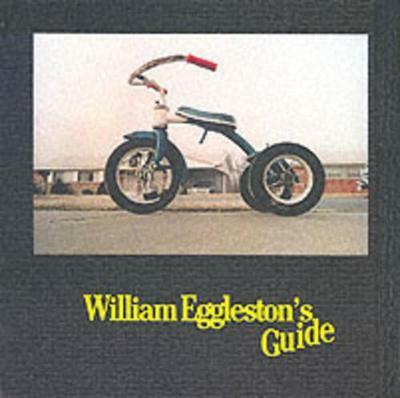 William Eggleston's Guide was the first one-man show of colour photographs ever presented at The Museum of Modern Art, New York, and the Museum's first publication of colour photography. The reception was divided and passionate. The book and show unabashedly forced the art world to deal with colour photography, a medium scarcely taken seriously at the time, and with the vernacular content of a body of photographs that could have been but definitely weren't some average person's Instamatic pictures from the family album. These photographs heralded a new mastery of the use of colour as an integral element of photographic composition. Bound in a textured cover inset with a photograph of a tricycle and stamped with yearbook-style gold lettering, the Guide contained 48 images edited down from 375 shot between 1969 and 1971 and displayed a deceptively casual, actually superrefined look at the surrounding world. Here are people, landscapes and odd little moments in and around Eggleston's home town of Memphis - an anonymous woman in a loudly patterned dress and cat's eye glasses sitting, left leg slightly raised, on an equally loud outdoor sofa; a coal-fired barbecue shooting up in flames, framed by a shiny silver tricycle; the curves of a gleaming black car fender, and someone's torso; a tiny, grey-haired lady in a faded, flowered housecoat, standing expectant, and dwarfed in the huge dark doorway of a mint-green room whose only visible furniture is a shaded lamp on an end table. For this edition of William Eggleston's Guide, The Museum of Modern Art has made new colour separations from the original 35mm slides, producing a facsimile edition in which the colour will be freshly responsive to the photographer's intentions. Edition Statement 2nd 2002. Corr. 2nd Printing ed. John Szarkowski is Director Emeritus of the Department of Photography at The Museum of Modern Art, New York, the author of numerous books and a photographer in his own right.